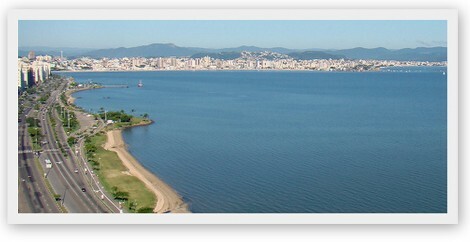 Florianópolis is the capital city of Santa Catarina state. It stands out as the province with the best Brazilian human development index (HDI) 0.875, according to studies by the UN in 2000. 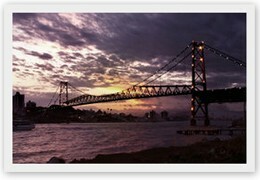 With approximately 400 thousand inhabitants, Florianópolis is a major tourist attraction in Brazil. On the island of Santa Catarina, being more than 100 beaches, it is difficult to choose the most beautiful of them. The beauty of the beaches coexists in harmony with modern Universities, Hotels and Technology Companies. Colonized by Azoreans (Portuguese form the Autonomous Region of Azores), the town has many points to enjoy food, culture and music. Tourism is the main source of income for the city. Behind microcomponents difficult to be seen with the naked eye, it hides a real gold mine, or better, of silicon, in Santa Catarina. The market for technology collect in taxes the double of tourism in the Capital does. And the growth of this sector (software, hardware and services) is staggering: an average of 20% to 30% every year. In 2007, revenue exceeded R$ 800 million. As a mean of comparison, tourism - one of the most important economic activities of Florianópolis - raised in Tax Services (ISS) around R$ 240 million in 2007, 50% less than the technology. Only the software segment rose close to R$ 480 million in the same period. The survival rate of which left the MIDI Tecnológico is 93%, whereas according to Sebrae, 90% of Brazilian companies close before completing a year of activity. Another major project that is running in the Capital is the Sapiens Park, an area of 4.5 million square meters located in the north of the island. The project not only provides shelter from technology companies, but according to the chief executive, José Eduardo Fiates, 15 years from now, when an area of 1.3 million square meters will be built and installed 500 companies, half should be based on technology. Santa Catarina is a state highly influenced by the immigration coming from almost all over the world. Polish, Russians, Germans, Portuguese, Austrians and Japanese are just some of the people that the cultural diversity of the state. Nature sets the tone along the Santa Catarina coast. There are 500 km of beaches, lined by lagoons, rivers, mountains and the exuberant Atlantic Coastal Forest. From the quiet Babitonga Bay, on the Paraná border, to the long stretch of open sea at Araranguá, the curtain rises on a fascinating scenery of clear waters, white sands and much greenery. São Francisco Island, at the extreme north, is home to the state's oldest settlement. Founded by the French in 1504, São Francisco do Sul houses valuable historic landmarks and a fascinating special charm. With 30,000 residents, it is a land of fishermen and sailors. The city sits atop Babitonga Bay, a nautical paradise of calm and sheltered waters with 13 beaches and countless islands on which nature rules. Across the Saguaçu Lagoon, one reaches Joinville, the largest city in the state and a landmark of German immigration. All these ethnic and cultural integration reveals a feature common to all peoples: the taste for parties. Once a year is the Circuit of Festivals of October, held around the state, and gathering traditions from Germany, Portugal, Italia and Austria, filled with good food and great beer! 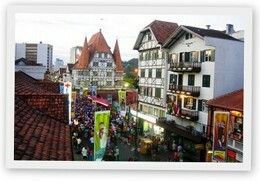 The Oktoberfest in Blumenau leads the show. It is the most popular event of the country, after the carnival, and attracts almost one million visitors. 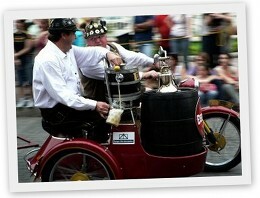 It consists of 17 days of parades and lots of fun, on which usually are consumed on average 400 thousand liters of cold beer. The Fenarreco of Brusque, the Fenachopp of Joinville, the Schützenfest of Jaraguá South, the Musikfest of St. Benedict, the Kegelfest of South River and the Oktoberfest of Itapiranga are events the revive Germanic traditions. The Austrian culture is shown in the Tirolerfest of Thirteen Tílias. The bazaar of Culture and Tradition in Criciúma, rescues the Italian heritage. In Itajaí, wine, and the sound of fado reminds of the Azorean past of the coast inhabitants.